Private GS – 79930 Arthur Leonard Atkinson, 4th Battalion Royal Fusiliers (London Regt), formerly 28466 Yorkshire Regiment. Arthur Leonard Atkinson was born in Great Busby, Stokesley parish, in the June quarter of 1897, the son of John Atkinson, a woodman born in Stokesley, and Elizabeth Hannah Reed, born in Great Broughton. The couple had married in Stokesley district in 1896 (they were both in their mid- twenties) and set up home in Busby village. Next door to them in 1891 were Elizabeth’s younger brother Charles Reed and his wife, and both John Atkinson and Charles Reed were woodmen on the Busby estate. The 1911 Census tells us that the family was then living at 2 Busby Cottages, Great Busby. John was still a woodman, but Arthur, aged 13 and at school, now had 3 younger sisters: Gertrude (born 1899), Laura (1905) and Clara (1907). 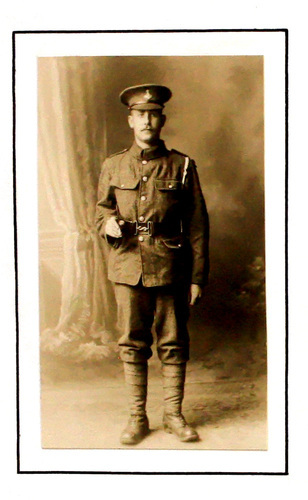 The Stokesley Book of Remembrance tells us that Arthur became a farm hand, and the records of the Yorkshire Regiment tell us that Arthur Leonard Atkinson joined up in Stokesley as Private 28466. His attestation papers do not seem to have survived, but we know that he was sent to France in January 1916, when he was still only18 years old. Arthur must therefore have been involved in the Somme Campaign in the summer of that year. The following year, 1917, he fought in another of the great battles on the western front, the Battle of 3rd Ypres (Passchendaele). This time he was not so fortunate, and he was wounded and gassed in October 1917. Arthur recovered from his injuries and went back to the front. He seems to have fought right through the perilous times of April and May, 1918, when the German army launched their final attack - Operation Michael - which for a time looked likely to succeed. It is not clear from surviving documents just when and why Private Atkinson was transferred into the Royal Fusiliers, but it was common practice that, following engagements where there were heavy casualties to a regiment, the surviving men were often allocated to new units and given new regimental numbers. Ironically, after having survived some of the most costly campaigns of the Great War, it was in its final stages, as the Allied forces swept forward to Victory in the autumn of 1918, that Private Atkinson was killed in action on 8th October 1918 at Cambrai. It was barely a month before the Armistice. Go to next soldier: Baines J.R.